After winding up 2017 with a lively Christmas banquet and long service award ceremony, Preston Scout House Alumni Band will be celebrating the 80th anniversary of its founding in 1938 with community oriented performances and special events scheduled throughout 2018. The Band, originally the bugle band of the 1st Preston Scout Troop, begins twice-monthly rehearsals in mid-January, to prepare for a local and regional performance schedule that will include the Scout House Spring Ahead free family concert on April 15, Preston’s Canada Day parade on July 1, Warriors Day concert for Preston’s Royal Canadian Legion Branch 126 in early September and annual Remembrance Day ceremonies on November 11. The Band’s repertoire will include songs popular with members and audiences in years past. *the annual Spring Ahead free family concert in mid-April. *a Cambridge Chamber of Commerce Business After Hours social evening. *performing the national anthem at the May meeting of Cambridge city council and updating council members on Scout House activities and plans. *display banners in downtown Preston marking the anniversary year. *requesting that the province of Ontario name a bridge on Highway 401 in honour of Scout House twin brothers who died in World War II. *a flash mob performance in connection with a Cambridge festival or special event. *a children’s colouring contest, with prizes to be awarded during the Scout House annual barbecue on Canada Day weekend. *a special concert for Preston seniors, in conjunction with a vintage car display. *inviting drum corps and other friends to attend events on Canada Day weekend, including a Friday evening social, 80-year memorabilia display at Preston Scout House building, Saturday afternoon concerts by Scout House groups and others, giant catered barbecue the day before the July 1 Canada Day parade. Recipients of Scout House long service pins, traditionally presented during the Christmas banquet, included the first five year members of Preston Scout House Cadets, the group initiated in 2012 as a drum line to help mark the organization’s 75th anniversary year in 2013. Five-year pins were awarded to 15 people, including eight members of the Cadets organization. Two people received 10 years pins and seven received pins for 15 years involvement. 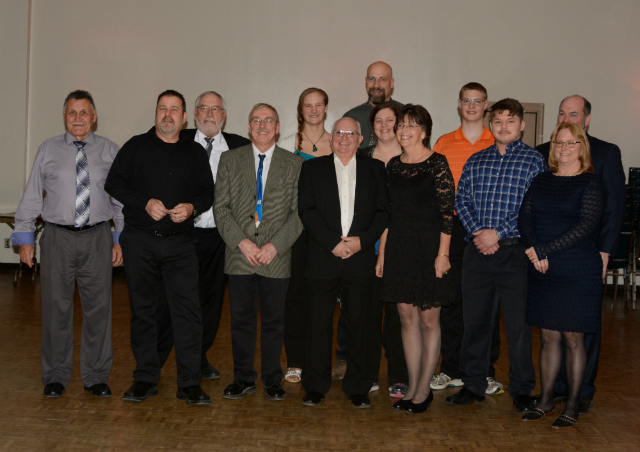 Scout House members attending the annual Christmas banquet who earned long service pins in 2017 are (from left) 15 year members Ray Hallman, Gord Cupskey; 10 year members Neal Titford, Jim Kennedy; five year members Sienna Joyce, Terry Ellison, Jody Joyce, Chantalle Joyce, Cheryl Riley, Gavin Joyce, Josh Rossignoli, Cindy Rossignoli, Jamie Rossignoli (rear). *Preston Scout House Alumni Band is for those over age 18, performing vintage tunes and other popular selections at events in the Cambridge area. *Silver Leaves Brass Ensemble and percussion accompaniment, an award-winning group which performs at drum corps and community events throughout the year. Posted by News Editor on Saturday, January 6th, 2018. Filed under Current News, DCA News, FrontPage Feature.